I wish you all a very happy new year with lots of knitting!! I am still working on Citron. As the amount of stitches is growing the knitting goes slower and slower. But I am halfway through the fifth repeat (this is the last repeat before the ruffle). And it is easy knitting because the laceweight yarn is so featherlight. The book my knitting is lying on is The Knitter’s book of Wool from Clara Parkes. A very nice book. 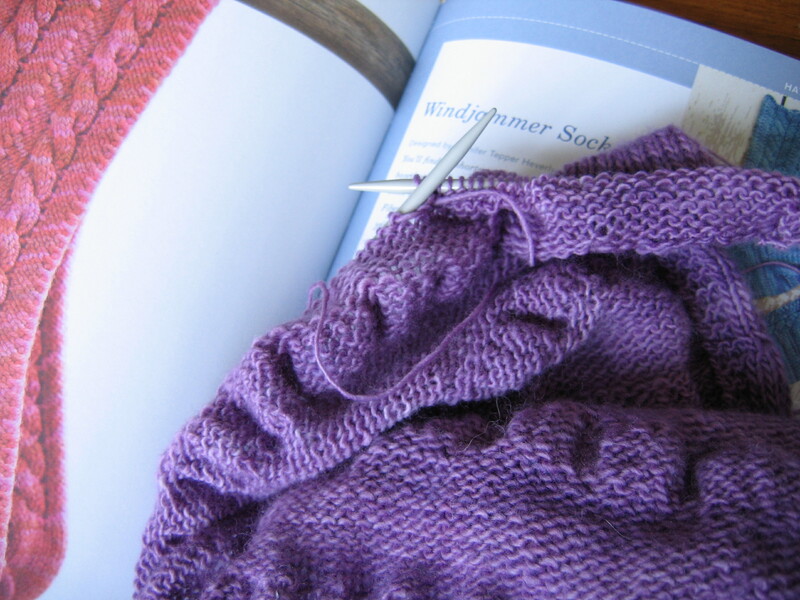 I am a big fan of A Knitter’s book of Yarn, and this book is just as good. I love reading about all the different types of sheep and the different types of wool they are producing. Especially interesting now I am knitting with the Purelife British Sheep Breeds yarn. There is a lot of info about how a fleece is turned into a yarn. It takes many different steps. The book also has a lot of patterns for different types of wool. I am probably not going to knit them, I like Rowan patterns better, but I use them as illustrations how the different types of wool look when knitted up and for what type of projects they can best be used. 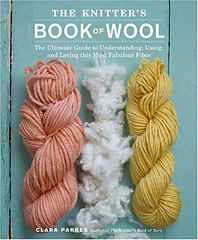 A very good and thorough book if you want to know more about wool. It is also very nice looking, with nice wool photos and very sweet and accurate drawings of sheep. I am also planning yarn subs for Ysolda’s Whimsical Little Knits 2. I ordered Malabrigo sock in Eggplant for Damson, and Malabrigo worsted in Applegreen for Ripley. I ordered at a Dutch webshop called HolyWoly. I am glad they had the eggplant colour, because I only want to knit Damson in the original colour, it’s perfect. I hope it will soon be here! This entry was posted in in progress, knitting books. Bookmark the permalink.